Flying hand launch gliders means living with small capacity receiver NiCad battery packs. These small packs are light, but have the distinct disadvantage of rapidly depleting. You can carefully time your flights, but you end up either crashing when your plane seizes or using only a portion of the already small capacity of the battery. If you charge the battery in a slightly suboptimal fashion, your plane dies and bites the dirt (done that, crashed). This devices will allow you to use a small mA pack and use the full capacity of your battery. This device of my design uses seven componants on a single side PC board. With a 6 inch connector, the whole thing weighs about 0.2 oz. The alarm sounds with a voltage at or below 4.5v, and the circuit draws 2.4-2.7 mA when quiet and 5.6mA with the alarm (in my Hitec system, a receiver and two servos draw an average 75-100mA when flying). The LM336 and 3k resistor provide a precision reference 2.5 volts, and the two other resistors are a voltage divider that provide the sample voltage. The LM311 is a voltage comparator, and powers the buzzer when the sample voltage crosses the reference. Since servos draw current abruptly and intermittantly, the ambient battery voltage is puncuated by a series of low voltage spikes. 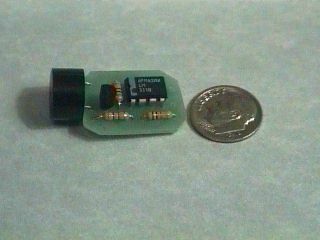 The capacitor (not in the original design in the picture) smooths these spikes somewhat so that the alarm does not chirp with every servo motion. These inverted voltage spikes are not so pronounced with larger capacity batteries; the capacitor may not always be be needed. While it is possible to smooth the voltage completely, this chirping provides a continuous and early indication of battery voltage. With the circuit here, the alarm chirps while slewing both servos of a reciever/two servo system when a 150mA battery is about half discharged, chirps with any servo motion when near completely discharged, and alarms continuously with about 5 minutes of flying time left. With a larger capacity battery, the sequence occurrs much nearer to complete discharge--perhaps no capacitor or a smaller one (say 1uf or 0.1uf) would do--and initial comparison with your measured voltages would be important to calibrate to your system. You can adjust the divider resistors for a higher or lower voltage alarm: Vout=Vin(R2/(R1+R2)) where Vout=2.5v and Vin is your selected alarm voltage, and R1 is the positive side and R2 is the negative side. Note that the LM336 has three pins and you only use two (break off the third). Solder a battery or servo connector to the board with positive and negative as shown, and plug the connector into an unused slot in your receiver. JDR Microdevices parts (San Jose CA, 1-800-538-5000, "No minimum order", order 24 hours a day, shipping UPS $4.95 for the first pound). Precision Receiver Battery Low Voltage Alarm electronic circuit. Models and model remote control electronic circuits and schematics.